Posted: Saturday, April 13, 2019. 2:11 pm CST. Belize is travelling through some uncharted waters in its legal and political history. The uncleared politicolegal atmosphere yesterday, which still hovers, is very dangerous for the state of affairs because the government is pushing its agenda against all odds. This is not a Judgement Day matter but they can create their own political apocalypse. They, knowing that a temporary injunction was granted is sufficient reason to use other strategies. The most prudent political measure should have been to inform the nation that the referendum is postponed until a better, more feasible date. That would have been a political gain. WE ARE NOT GOING TO THE ICJ FOR A SACK OF DIAMONDS NEITHER WILL A RESOLUTION FROM THE ICJ ENDS THIS CLAIM. DON’T SAY YOU WEREN’T WARNED. Art. 19 Transitory in Guatemala’s Constitution will be the source for future challenges at their Constitutional Court. Which I have referred to over and over again. This is not fear mongering. I have no conflict of interest to fear monger anyone. There is a saying in Spanish “Errar es de humanos y de rectificar es de sabios”: To err is human but to rectify is of the wise. This was precisely what the leader of the Opposition, Johnny Briceños, did. He rectified. This government has had many instances of challenging legal dispositions and have failed and at a cost of hundreds of millions of taxpayers dollars. The IQ can’t be that low and the arrogance that high! It is imperative to emphasize that Judicial resolutions in democractic countries are to be obeyed. It is the essence of a check and balance system. In despotic and fascist states, the judiciary functions as a total coercer and to the interest of government and the state. Judicial dispositions are obeyed and are the basic principles that lawyers and political scientist learn at the university. There is a saying in law classes in Spanish that says “FALLOS JUDICIALES NO SE DSCUTEN. SE ACATAN.” You may not agree with the resolution but you have respect it, obey it, and comply with it. This is especially so for politicians in office in virtue that they should show the examples and that they take the Oath of Allegiance. Also it is to cut their wings because some tend to fly high, which they show by the abuse of power or the usurpation of functions or powers. If one don’t agree with the resolution, there are appeals. However, the due process must be followed. When politicians don’t comply with or obey judicial resolutions they could be declared in disobedience to the law and could be asked to vacate their post and more so when the law violated is of constitutional nature. In such a case, for example, the Governor General as Head of State, in representation of Her Majesty the Queen, could have no other option but to revoke the appointment in this case of the Prime Minister and could dissolve the National Assembly and call for GENERAL ELECTIONS. So the Prime Minister’s caprichosness and/or temper tantrum could cause him his seat and his investiture or appointment and in that case his shot would have backfired. I wrote about this in my article “Party Leadership and Prime Ministership” right here on BBN. According to our Constitution in Art. 37 paragraphs (1 & 2) and I quote . There shall be a Prime Minister who shall be appointed by the Governor General. I would recommend that both paragraphs of this article be ammended as soon as possible, but most likely by the next government. An amendment that will give us as voters our full sovereignty and make our choices be constitutional. Right now, the way our Constitution is, the tortilla can be turned over in the House and it would be constitutional because our practice in this respective, that is the election of our Prime Minister, is customary and not necessarily constitutional. So if the Governor General appoints the Prime Minister, he can also revoke his appointment or mandate and stripped of investiture. The Prime Minister can argue that he was elected but he was not necessarily elected to become Prime Minister of Belize because according to our Constitution being the Party Leader doesn’t automatically transpose to prime ministership. He was elected as a Representative and became Prime Minister as of appointment while in the House. 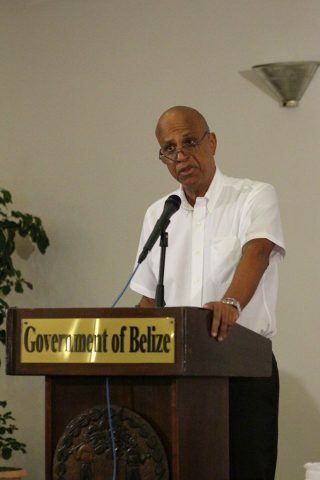 Let me break this down, we have had this customary practice that political parties elect their party leader and base on tradition that person automatically becomes the Prime Minister of Belize. But Art. 37 (1 & 2) of our Constitution ‘se da no so this thing go’. Such practice has been unconstitutional but never challenged. According to our Constitution, it is the Governor General to appoint the Prime Minister. But it has never been that way since Independence. We have had the practice and in our minds that whichever party leader wins he automatically becomes P.M. and I say he because only males have had that post but female party leaders are springing up so we will soon say he or she. We should start to obey our Constitution. Ironically, not the Governor General carries out his investiture as stipulated by our Constitution. Every Belizean should have a copy of our Constitution whether electronic or physical. A Constitution in its wording and use isn’t exclusive for lawyers, politicians, nor political scientists. It is written and for the use of every citizen. If both Belizeans and Guatemalans would have respected their respective Constitutions. There would be no referendum in Belize and the question in Guatemala’s referendum would have been different. Since such referendum practiced in Guatemala, and the one to be practiced in Belize violates the Constitutions then our court on our behalf should declare our referendum practice nulo ipse jure. That is, null and void and force the parties to go back and negotiate and do the things constitutionally right without the presence of the OAS because they advocated for violating both Constitutions rather than to be guarantors of constitutionality. All the agreements signed with Guatemala since 2000 violated our Constitution grossly and curiously by lawyers who should know better. I continue to say: OUR CONSTITUTION IS, UNTIL WE MAKE AMMENDMENTS. So the government must be careful with legal procedures, otherwise things could backfire and instead of having a referendum, we end up having general elections.